Sunday, March 26 from 1-3 pm! This Water Front Setting Is Priceless! 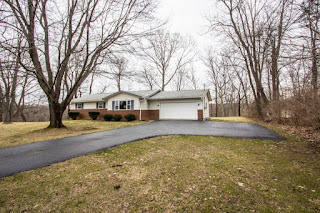 Over 4 very scenic acres with woods, ravines, seasonal views of Little Turtle golf course and backing to Big Walnut Creek/Hoover Reservoir run off. Enough land and road frontage to potentially build another home. Very well maintained Ranch home with full Basement and 3 Bedrooms. Updated roof, gutters, windows, furnace, A/C, H2O heater, carpet and more! A great location, convenient to everything! 3 BR’s & 1 Bath. Westerville schools. Only $324,900!